Disaster recovery might still seem like a very difficult sale at many companies, but our research shows that more companies are indeed investing in it. 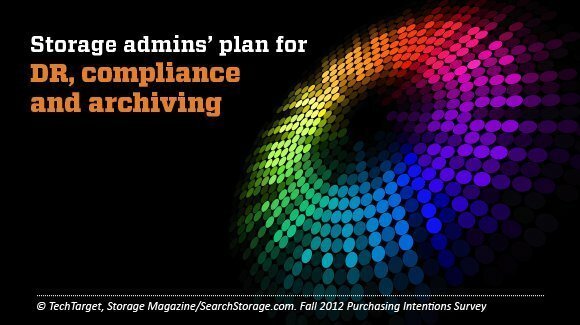 And they're also showing greater faith in archiving and compliance technologies than in past years. This fifth of five reports on Storage magazine's fall 2012 storage Purchasing Intentions Survey results provides perspective on what your customers' spending plans are for advanced data protection. In the survey, we asked storage administrator respondents whether they would change their disaster recovery-related spending, what types of products they would allocate their DR spending on (remote replication, off-site tape or online vaulting), whether they would change their spending on archiving products, and what types of archiving products they planned to buy (for instance, email archiving, file system archiving or database archiving). This spending plans survey was directed and analyzed by Rich Castagna, editorial director of Storage magazine and TechTarget's Storage Media Group of websites. It was conducted in September 2012, and respondents were screened for specific storage purchasing authority. There were 702 qualified respondents from among all vertical industries, reporting an average annual revenue of $1.3 billion and an average 1.7 petabytes of data under management on all types of media.